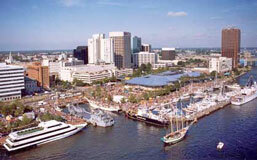 Carnival Cruises offers several cruises out of Norfolk, Virginia. Take a cruise to the Bahamas, to Bermuda, or a quick 2-night cruise to nowhere. A Carnival fun ship cruise is one big party. Every one of Carnival's "Fun Ships" is a floating resort designed for your pleasure. Experience the outdoor areas, wonderful restaurants, friendly casino, relaxing lounges, invigorating spa, exciting nightclubs and duty-free shopping. Come aboard and see for yourself why they're the fun ships. The Carnival ships have four swimming pools, acres of teak decks and a state-of-the-art spa. A variety of delicious meal choices and plenty of entertainment will make your trip one that you'll never forget. 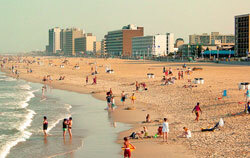 Visit NorfolkVisitor.com for a list of Carnival Cruises departing from Norfolk.